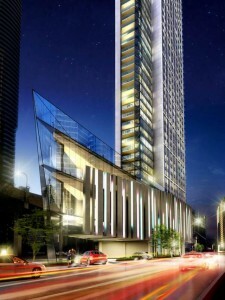 Tridel’s newest project Ten York, located at York Street and Harbour Street (10 York St) in Toronto’s Harbourfront neighbourhood, will be an iconic addition to Toronto’s skyline. Ten York will be a 224 metre (735 feet) glass vision. Steps from the waterfront, it’s at the intersection of everything the city has to offer. Only steps to the Air Canada Centre, Rogers Centre, and the CN Tower, residents will never be late to a concert or sporting event. Ten York will be an architectural marvel. This statuesque beauty will soar dramatically up from a triangular-shaped wedge alongside Toronto’s major city artery. This is only part of what will make Ten York one of the most prominent locations in downtown Toronto overlooking Lake Ontario. It will also be conveniently connected with the weatherproof comfort of The PATH, downtown Toronto’s underground walkway, the subway, GO Train and Union Station. Ten York residents will have the city at their feet and the world at their doorstep. Rudy Wallman Architects Ltd., II BY IV Interior Design and landscape architects Janet Rosenberg + Associates. Ten York will be 65 storeys, with 725 units and 289 parking spots.